One of the things Vietnam is famous for is their very tasty and to-die-for coffee. I have been to Vietnam twice and I have never failed in bringing back coffee. 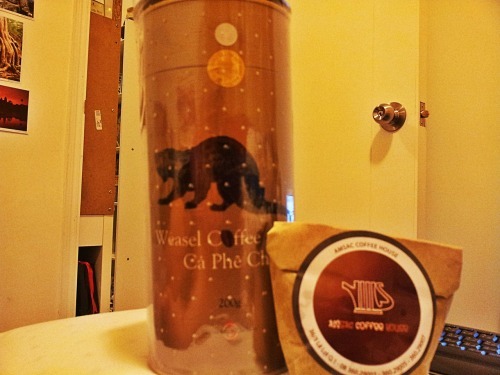 Last Saturday, when I was in Ho Chi Minh, I have tried their Weasel coffee which is included in our very touristy city tour. At first, they didn’t told me that it was Weasel coffee, should they said so, I swear I wouldn’t have drank it. But in the end, I ended up buying a pack so really, it’s really good! The second pack has its own story to tell. It was our last night in Ho Chi Minh, and I was really craving for some chocolate milk, unfortunately shops were closed except for a cake shop and an ice cream shop. There’s a shop near our B&B which sells coffee. I thought maybe they are still making coffee at this time of the night, since I saw that they were actually renovating. The guy in the shop offered me a cold milk for free and what’s more? This little pack of coffee for free as well! I can’t believe it, although he might be promoting their products to me (who is not sure if she’s coming back or what?). Anyway, in return I told him that I will promote his coffee to my friends.